I am not very good at designing rooms, but I try hard! That being said, I am very pleased with how our playroom is coming along. What was once the least appealing room in the house (not including the master bathroom) is now quite enjoyable to spend time in. I discovered that it is hard to convince your children to keep their toys in a room if you don't enjoy being in there with them. We still have some things to work on, but things are coming along nicely. I fell in love with this chair about 7 years ago. My neighbours across the street were having a yard sale and it was on their driveway. It looked like garbage, but somehow I loved it. I spent all day watching it and finally talked to Richie and we went across and bought it for $5. I replaced the seat cushion and slip covered the chair. We loved it and rocked babies in it for years. 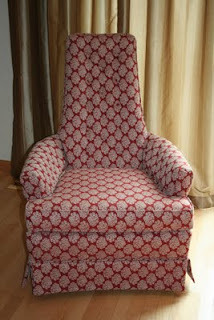 Finally the slipcover started to wear out and the chair needed to be fixed again. This time I decided to reupholster it. I looked for months for the perfect fabric, beautiful and cheap. I finally found it. It didn't take me long to realize that I did not want to do the work myself so I had it done. 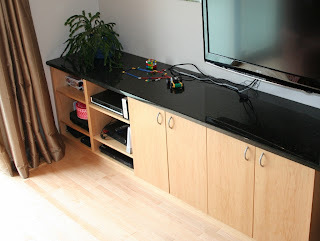 Here are our built in cabinets and fantastic countertops that we enjoy. This view shows how it goes together. Behind the chair is a magnetic board for the kids and some builder squares attached to the wall hold the children's art. 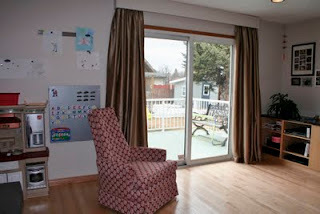 We replace the carpet with hardwood floor and the outdated vertical blinds with drapes that I made. The other end of the room has a great tyndall stone fireplace. Unfortunately I did not get a nice picture of it. The couch also needs to be slip covered (again) - so I deliberately left it out. The colour of the room is Cedar Key by Benjamin Moore.